WINDY CITY PULP CONVENTION 2014 REPORT, by Walker Martin. As many of you may know I love going to pulp conventions and I’ve been attending them since 1972. I have a maniacal desire to read and collect old books and pulps. I realize it may be an addiction and a vice but it doesn’t seem to hurt my health or finances like drinking, drugs, gambling, or chasing women. Well at least it didn’t hurt me until this convention. Needless to say, being the insane collector that I am, I ignored all medical advice and on Thursday, April 24, I was in a car heading from Trenton, NJ to Morristown, NJ, where I was one of five collectors who had rented a big van. After an hour in the car, and even before getting to the van, I was in distress and reminding myself that I was a book collector and reader and nothing was going to stop me. I had to keep saying this to myself several times during the trip, which I now refer to as Death Trip 2014. But somehow, 15 hours later, I limped into the Westin hotel near Chicago and thought only about going to my room and having a stiff drink, pain pills or no pain pills. But in my room, the usual desire to meet other collectors and talk about books and pulps, kicked in and I went to the hospitality room. Once there, I stationed myself against the wall near the refrigerator where the beer was and I proceeded to drink, thinking By God, I made it. And I’m glad I did because I met a man who runs one of the very best pulp blogs. Sai lives in India and administers a blog called Pulpflakes. A great name for a great website and it’s all about pulps, the authors, the editors, the artists, the magazines. This was Sai’s first pulp convention. Another interesting person was Mala Mastroberte, the queen of the pulp pin-ups. Ed Hulse had the great idea to have her at his BLOOD n THUNDER table and perhaps it was too great an idea. I heard more than one collector refer to table not as the BLOOD n THUNDER or Ed Hulse table, but as the Mala table. Mala was a big hit and fortunately she had her boyfriend to watch over her because some collectors are all about the books and they don’t know how to act around women. Nothing worse than a leering bookworm. I ought to know. But don’t feel too sorry for Ed Hulse because he stumbled across the find of the show. Shortly after the convention opened he bought several long comic book boxes of ALL STORY. Most seemed to be priced at $5.00 and included several Edgar Rice Burroughs issues. Most were from 1917-1920 and there were over a hundred. I need one issue from this period and since I only need a total of 4 to complete my set, I was naturally very excited and figured the issue had to be there. Since we were all busy the first few days of the convention, there was no time to look through the magazines until Sunday afternoon. With great anticipation I watched as the magazines were sorted into years and then into months. The issue I need is dated July 7, 1917 and I noticed there were 11 months well represented from 1917. But one month was completely missing. You guessed it. No July issues at all. There is nothing more embarrassing than seeing some old guy sobbing because he needs a pulp. I managed to control myself and slunk off to the bar to drown my sorrows. I can deal with leg pain but not with missing out on my book wants. A good friend of mine told me about his find. He bought over 50 WEIRD TALES from the 1930’s for only like $25 to $45 each. I couldn’t believe such good luck and almost had him convinced that something must be wrong with the issues, perhaps pages excerpted or poor condition. But no, the magazines were ok.
At this point I’d like to talk about the importance of attending these conventions, not only Windy City, but Pulpfest and the few one day shows that are held. I realize there are valid reasons for not attending, such as poor health and lack of money. But I’ve always forced myself to figure out someway to attend because I find so much not only in the dealer’s room but through friends and contacts. For instance I managed to get the several lots I wanted in the auction. If I had stayed home because of my leg problem, I never would have gotten them. Collecting has helped increase my desire to keep living, otherwise I might just pine away and eventually waste away like many of my non-collecting friends. I would have to say collecting books and pulps is the grandest game in the world and one that can give your life meaning. Now you might ask what did I get after all the trouble described above? Well, one problem with living a fairly long life is the chance that you might start to run out of things to collect. I guess at one time or another, I’ve collected just about every major pulp, digest, and literary title, including many slicks. I never bothered with the love, sport, and aviation genres but I’ve been involved with most other titles. So my wants are getting kind of esoteric and bizarre. A few issues here and there to complete sets. A few pulp artists or magazine cover paintings. Many years ago I used to collect the hero pulps but I sold them all. But the auction listed several lots of the SHADOW digests. They had most of the issues from 1944-1948, a total of 40 in all. 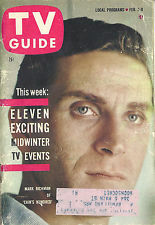 I was interested in these issues because the magazine became more of an adult crime magazine during the post war years. Returning WW II vets did not give a damn about the Shadow but the back up stories and novelettes were of interest. I managed to be the high bidder on all the Shadow digest lots, a total of 10 lots. The average price came out to only $21 per issue which was far lower than the $50 -$80 prices that I saw in the dealer’s room. Another item I desperately wanted was a preliminary sketch by artist Lee Brown Coye. The finished piece of art in FANTASTIC, February 1963, I think is stunning and I noticed the preliminary drawing was very detailed and close to the finished art. Again, I was the winning bidder at $650. Speaking of the auctions, there were two that lasted several hours during the evening. The Friday auction was mainly from the collections of the Jerry Weist estate and the Robert Weinberg collection. The Jerry Weist items were mainly very nice condition SF magazines and the Weinberg collection included some stunning SF correspondence, cancelled Munsey and Popular Publications checks and all sorts of interesting items. The original manuscript of C. L. Moore’s “Black God’s Kiss,” which appeared in WEIRD TALES, October, 1934, bought the highest amount of money I’ve ever seen at a pulp convention auction: $4,500 plus the $500 buyer’s premium. That’s $5,000 for an iconic, unique item. Some other authors represented by checks and letters were L. Ron Hubbard, Farnsworth Wright, Henry Whitehead, Abraham Merritt, Austin Hall, Homer Eon Flint, Edgar Rice Burroughs, Murray Leinster, Isaac Asimov, Fred Pohl, Otis Adelbert Kline, George Allan England, Algis Budrys, Eric Frank Russell, and others too numerous to name. The Saturday night auction was made up of over 100 lots listing most of the issues of the SHADOW magazine. Most issues went for reasonable prices. Following the SHADOW auction there were almost another 100 lots listing various pulp magazines but there also was a Frank R. Paul illustration from FANTASTIC NOVELS which went for $800. The Windy City show is not just the dealer’s room and auction, though that’s what most collectors are interested in. There also was a very large art show with quite a few pulp paintings and illustrations from the collections of Doug Ellis and Deb Fulton, Robert and Phyllis Weinberg, and others. Ed Hulse put on his usual fine film show which lasted all day and even after the auction in the early morning hours. The themes celebrated the 95th birthday of BLACK MASK and WESTERN STORY. There were two panels after the dealer’s room closed. The first one was on a subject that was very much needed but had often been ignored over the years at Pulpcon. The Western Pulps panel was comprised of Ed Hulse, Walker Martin, and Tom Roberts. In about an hour we tried to make up for lost time and discuss major elements of this important topic. Which of course is impossible since there were scores of western titles and it was the biggest selling genre by far except for perhaps the love pulps. I gave my opinion concerning the best western pulp magazines, all of which I have collected over the years. The biggest of all was WESTERN STORY, 1919-1949 with over 1250 issues. I need about 11 issues including the first one and I’ll never be able to complete the set but I have hopes of getting it down to single digits. The second best and some would say even better than WESTERN STORY, was definitely the Doubleday issues of WEST during 1926-1934. During this 8 or 9 year span the magazine was often published on a weekly and bi-weekly schedule and had all the good authors. It was sold to another publisher in 1935 and continued on for many years but not at the Doubleday level. Third and fourth best would be DIME WESTERN and STAR WESTERN and some feel they were the best westerns published by Popular Publications. We now live in a era that has no western short fiction magazine and this is hard to believe when we look back to the 1930’s and 1940’s when the newsstands groaned under the weight of these titles. There were many interesting western writers and some of my favorites are Luke Short, W.C. Tuttle, and Walt Coburn. Coburn had a drinking problem and this showed in some of his work but when he was feeling good and sober, he was one of the best because he grew up on a working cowboy’s ranch and knew how the men dressed, talked, and rode. Black Dog Books will soon be publishing a collection of Coburn’s fiction from WESTERN STORY. Keep an eye out for BULLETS IN THE BLACK by Walt Coburn. Introduction by the great James Reasoner. My old friends of 20 or 30 years ago would have said that I have committed sacrilege by not including Max Brand. Max Brand collectors used to be all over the place at Pulpcon, collecting the pulps, binding the stories into home made books, writing articles and talking about him. In fact, if they were still alive I would not dare say anything negative about Brand. Not if I wanted to keep their friendship. They loved Max Brand and for over 50 years I’ve tried to love him also. Some of his work I like and some I hate. I now would have to say that Max Brand wrote too much and too fast and that’s going to hurt him as far as being remembered. The Second panel was on Saturday night and discussed Hammett, BLACK MASK, and the Detective Pulps. Moderated by John Wooley along with such experts as Ed Hulse, Digges La Touche, and Bob Weinberg. I was so jealous about not being on this panel that I tried to pick a fight with Digges by yelling at him, “So You’re the expert on Earle Stanley Gardner!”. But I didn’t have enough to drink to be drunk enough, so they ignored me. Bob Weinberg did make one interesting statement about the cover art of DIME DETECTIVE being better than the covers of BLACK MASK in the 1930’s. Maybe the late thirties yes, but when Paul Herman, another BLACK MASK art collector, and I heard this, we started muttering that though we love and have covers from DIME DETECTIVE, the early 1930’s covers of BLACK MASK are amazing. Joe Shaw made sure the cover artist captured the tough, hardboiled, atmosphere of the magazine. The funny thing is that someone told Bob Weinberg about my disagreeing with him. Later on, he approached me and told me I was wrong, and how could I say such a thing, etc. But this just shows why Bob and Paul and I, are pulp art collectors. To collect cover art you must be opinionated and passionate about the subject. Otherwise you don’t collect original art at all. The program book, which is compiled and edited by Tom Roberts, is excellent. About 50 pages on the detective pulps, another 50 pages on the western pulps, and 50 pages on art and film. I’m certain you can get a copy from Black Dog Books. On Sunday, I talked with Doug Ellis about the attendance. He said they broke 500 for the first time ever (the most the old Pulpcon ever had was 300) and had 150 dealer’s tables. I spent the entire three days limping around the room and the place was always busy. The old Pulpcon used to have periods where it looked deserted but you don’t see this at Windy City or Pulpfest. So, on Monday morning, in a steady rain, we just barely crammed in all our treasures into the great white van. There were a couple times I almost said to stop the van, so I could get out, but we made it back to Morristown in about 14 hours. I was so exhausted that I wondered if I could make it to the car for the ride back to Trenton. We transferred all the boxes to Digges’ car and were ready to go. I told myself, look I just made 14 hours, I can make another hour or so. Then Digges told me the car battery was dead and the car would not start. At this point the details are a sort of blur for me. I remember standing in the dark and thinking what now? If it was up to me, I’d still be standing there. Fortunately Ed Hulse’s sister let us come into her house even though it was late and gave us coffee. She even called her Triple A and had them jump start the car. So off we finally went. Now the big question is will I be able to make to Pulpfest, August 7, 2014? Collectors, you better believe it! 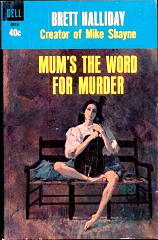 Reviewed by William F. Deeck: ASA BAKER [Brett Halliday] – Mum’s the Word for Murder. ASA BAKER – Mum’s the Word for Murder. Stokes, hardcover, 1938. De11 #743, paperback, 1953, as by Brett Halliday; several other Dell printings likely, including Dell #5918, 1964. Asa Baker — the narrator, not the pseudonymous author — writes Westerns when he doesn’t have writer’s block. Thinking of branching out into the mystery field, he accompanies his friend Jerry Burke, co-ordinator of law enforcement in El Paso, Texas, while he investigates several murders that had been advertised beforehand in the newspaper. Three unconnected killings take place, each announced in advance, with the primary suspects all having unimpeachable alibis. The plot is a good one. While contending something is a “first” is folly without having read every mystery published, I will say it is the earliest example known to me of this device. The most well-known use of it didn’t appear until 1950. That having been said, I cannot otherwise recommend the novel. Baker fancies himself the superior of the El Paso Chief of Detectives, but is just as much a nitwit. Jerry Burke is colorless. The writing is little above hack. In addition, the paperback edition also has the flaw, or so I would contend, of having been updated. For example, pay phones cost a dime in the edition I read [from 1964] , whereas they were only a nickel in 1938. — From The MYSTERY FANcier, Vol. 13, No. 2, Spring 1991. Editorial Note: Mike Nevins reviewed this same book in one of his columns late last year, while you can find my comments on The Kissed Corpse, the other “Asa Baker” title, posted here on this blog earlier this year. Reviewed by Dan Stumpf: JOHN MAIR – Never Come Back. JOHN MAIR – Never Come Back. Victor Gollanz Ltd., UK, hardcover, 1941. Little Brown & Co., US, hardcover, 1941. Oxford University Press, US, softcover, October 1986. Film: Tempean, 1955, as Tiger by the Tail; released in the US as Cross-Up. I want to preface this review by saying that I have long suspected that there is no vast, secret conspiracy to weaken our nation, rule the world, or put mind-control drugs in our morning coffee. There may be a litany of irritating little organizations with these ends in sight, but no vast secret one. That’s what I suspect, anyway, and there’s a good reason why I know there isn’t any Giant Conspiracy secretly running our lives: If the Army taught me anything at all, it’s that the bigger the organization, the more the entropy — as Edward Snowden, Private Manning and Major Nidal have so clearly/tragically demonstrated. And I recently found my anti-paranoid suspicions pleasantly realized in this old book. 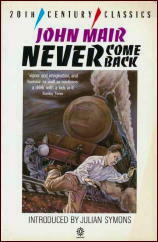 I first heard about John Mair’s Never Come Back from a passing reference in (where else?) a reference book. Intrigued, I found a copy (and isn’t the internet a wondrous boon to curious readers?) and proceeded to enjoy a thriller like no other. Subsequent research has led me to discover that all the best things about it have already been written, but I’ll recap my thoughts here anyway, as this is a book that deserves notice, particularly for fans of John Buchan. The central character, Desmond Thane, starts out as a hack-writer for a syndicate, making up human interest articles that are sold to newspapers as filler. He quickly finds himself in Richard Hannay territory though, after leaving the apartment (or flat, if you must) of a murdered woman who turns out to have been involved with one of those Shadowy International Organizations that seem to have been rife in England between the wars. As one might expect, he’s soon in possession of the usual MacGuffin, suspected of the murder, and on the run from the SIO. Happy the man, he thought, without mental or physical passions, ignoring with equal scorn the bookshop, the brothel and the travel agency. A pity one couldn’t sell oneself to the devil nowadays; the decline of piety had knocked the bottom out of the market, and reduced the wicked to an unwanted proletariat, with nothing to sell but their already conquered souls. Faustus had got twenty-four years power and glory for throwing over law, medicine, logic and philosophy; today every capital was crowded with scholars who were willing to abandon all four and a good many more for a guinea a thousand and an occasional lecture tour. There was over-production of vice as of everything else. That’s the attitude we get from Thane as Mair trots him through the usual paces of the genre with style and speed. We get kidnappings by various and sundry bad guys, narrow escapes, cross-country chases, phony cops, seductions, a criminal mastermind with dreams of global conquest… I could go on, but if you’ve read much of this sort of thing, you pretty much know what to expect. The difference here is Thane’s attitude and Mair’s canny view of the whole genre — not quite spoof but definitely dubious. The Sinister International Organization turns out to be rather bureaucratic and inefficient, Thane resists torture only because he doesn’t know what the hell the bad guys are after, and when he finds out how valuable it is, his first thought is to sell it back to them and retire in comfort. There are about a dozen pages of misplaced whimsy while he fakes amnesia, but things soon get right back on the sardonic track; It seems that the Chairman of the SIO board (and would-be Ruler of the World) has written a book and Thane, like any curious man of letters, feels compelled to read it. Which leads to a scene so unexpected and screamingly funny and perfectly Right that I won’t spoil it for you — check it out. Biographical Note: This was the author’s one and only novel. He died in 1942 in a training flight accident as a pilot for the RAF. The book has been reviewed elsewhere on the Internet by author Martin Edwards on his blog. Check it out here. A TV Review by Jonathan Lewis: THE TWILIGHT ZONE “Steel” (1963). 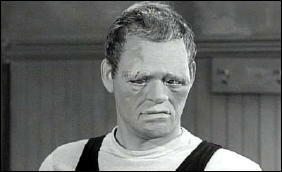 “STEEL.” Episode of The Twilight Zone. CBS. Season 5, Episode 2. October 4, 1963. 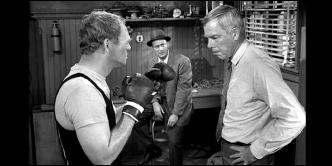 Lee Marvin, Joe Mantell, Tipp McClure. Director: Don Weis. Stories set in a future that have long since passed are often particularly fascinating to read. They do not merely portray imagined futures. They also provide critical insight into how writers understood their own eras within the context of History’s tripartite realms of past, present, and future. Most significantly, many of these stories revolve around man’s complex relationship with technology. Consider, for instance, George Orwell’s Nineteen Eighty-Four (1949), Nevil Shute’s On The Beach (published in 1958, but set in 1963), and Arthur C. Clarke’s, 2001: A Space Odyssey (1968). The years in which those novels are set have long since come and gone. When we read these novels, we are reading fiction set simultaneously in the future and in the past. True, they are works of fiction; the books’ authors did not intend them to be prescient renderings of what was yet to come. Still, it’s worth reflecting on the fact that humanity did not usher into existence the most compelling aspects of these novelists’ imagined futures. More countries have democratically elected governments than ever before. Humanity avoided a nuclear holocaust. Man hasn’t traveled to Saturn. Scientists have not created an artificial intelligence nearly as advanced as HAL. Well, not yet, anyway. Similar to the aforementioned novels, The Twilight Zone episode, “Steel,” based on a Richard Matheson story of the same name (published in the May 1956 issue of The Magazine of Fantasy and Science Fiction), also takes place in a future date that is now past. 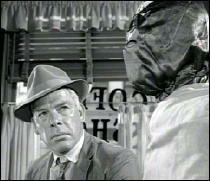 The episode begins with Steel Kelly (Lee Marvin) and Pole (Joe Mantell) escorting a shrouded figure off a bus and into a small town diner. We soon learn that the mystery man accompanying them isn’t a man at all. Rather, he — it — is a fighting android answering to the name of Battling Maxo (Tipp McClure). Steel Kelly and Pole are in need of some prize money. Maxo, a B2 unit and a heavyweight, is set to fight a more advanced B7 unit named Maynard Flash (Chuck Hicks). Problem is, Maxo experiences mechanical failure right before the big fight. That’s when Steel Kelly, a former boxer, comes up with what he considers to be an ingenious plan. He’ll pretend that he’s Maxo and will go in the ring against Maynard Flash. Pole urges against this idea. Steel, portrayed with gusto by Lee Marvin, is not about to be swayed. He’s determined to see this through. All too human, Steel is both courageous and foolish. As one might guess, he doesn’t win the fight. Upon hearing these words spoken and seeing Steel collapsed on the floor, I initially felt a sense of disappointment at how the episode ended. Lee Marvin was excellent, the androids appeared both plausibly human and uncannily creepy, and the writing was tight and without sentimentalism. But something was missing. That’s when I realized that “Steel” is best appreciated within the context of stories set in the past, but which take place in the future, similar to the novels I alluded to previously. In order to appreciate this particular Twilight Zone episode, one has to imagine oneself watching it when it was first aired, some two years after President Kennedy’s moon speech and two months after Martin Luther King Jr.’s “I Have a Dream Speech” in which he declared that, “1963 is not an end but a beginning.” Indeed, “Steel,” when considered within dual contexts of advancing technology and changing legal norms, packs more of a punch than when viewed without reference to contemporaneous political issues. The episode’s theme of man’s relationship with technology, however, is a far more universal one. Ever since the Gothic horror of Mary Shelley’s Frankenstein (1818) and Victorian-era science fiction, the relationship between man and machine has been a constant theme in the genre. In this light, “Steel” isn’t a bad episode. It just seems as though it would have been a much better episode to watch and to ponder in 1963 than in 2014. A Movie Review by David Vineyard: THE EXTRAORDINARY ADVENTURES OF ADELE BLANC-SEC (2010). THE EXTRAORDINARY ADVENTURES OF ADELE BLANC-SEC. 2010. First released in France as Les aventures extraordinaires d’Adèle Blanc-Sec. Louise Bourgon. Mathieu Amalric, Gilles Lellouche, Jean-Paul Rouve, Jacky Necessian, Philip Nahon, Nicolas Giraud, Laure de Clermont. Written and directed by Luc Beeson, based on the comic albums by Jacques Tardi. Cartoonist Jacques Tardi is likely best known at this site for his iconic adaptation of Leo Malet’s hardboiled sleuth Nestor Burma to graphic form, but long before that he put pencil to paper to record the adventures of Mam’zelle Adele Blanc-Sec. early 20th century reporter, adventuress, and proto feminist extraordinaire. And like the dry white wine she is named for Adele has snap and bite, a tall red haired lovely dreadnought ploughing all before her beneath her wake. She’s a lady on a mission, and nothing and no one will distract her. Droll is the best way to describe this charming film which you may compare to The Assassination Bureau and Dinner for Adele (Nick Carter in Prague), two other charming forays in the early 20th century as seen through its popular literature and rose- colored glasses. Bear with me as I try to describe the plot, though it is no easy task. In Paris Professor Esperandieu (Jacky Necessian) is experimenting with his power to project his mind when he awakens a pterodactyl in an egg in a museum in Paris. The new born escapes and promptly tries to eat the newly named Foreign Minister, who dies with his showgirl mistress in the Seine when his car is attacked. Across town Inspector Caponi (Gilles Lellouche) is assigned to the case of the Minister and the pterodactyl and young scientist Zborowsky (Nicolas Giraud), who has a crush on reporter and author of Le Monstre du Glaces, Adele Blanc-Sec, and his mentor Professor Menard (Phillipe Nahon) have discovered their pterodactyl egg has hatched, a fact they would just as soon not share with Caponi so they put him onto Esperandieu as an expert in the Jurassic era. Adele is busy in Egypt where she is stealing the mummy of Rameses II’s physician Patmosis despite double crossing native partners and her ruthless nemesis Professor Dieulveult (Mathieu Amaric). She won’t be deterred though, her sister Agathe needs care only the physician Patmosis can provide, and she is determined to return to Paris with his body where Esperandieu will awaken him to cure Agathe. Adele outwits her greedy partners and escapes Dieulveult with the mummy in spectacular manner while piloting his coffin down the Nile. Back in Paris as Adele is returning home with Patmosis, the government has summoned big game hunter Saint Hubert (Jean-Paul Rouve) to dispatch the pterodactyl and Esperandieu has been arrested and is about to be executed for his role in the minister’s death. Now Adele has to rescue Esperandieu, awaken Patmosis, and save Agathe, who has a hat pin skewering her head and is in a trance-like state, thanks to a particularly savage return by Adele in a heated tennis game five years earlier. While Saint Hubert and a reluctant and hungry Caponi seek the pterodactyl, Zoborowski lures the pterodactyl back to the museum, and a frustrated Adele attempts time after time to help Esperandieu escape. One false move or note, and this kind of froth can fall completely apart, but writer director Luc Beeson (The Professional, La Femme Nikita, The Fifth Element among others) keeps it moving like a clockwork and gets more than able support from his flawless cast, including his lead, Louise Bourgon — the image of Tardi’s Adele, if even more formidable. And if she can’t rescue Esperandieu any other way she will break him out with the help of the pterodactyl as she rides it across the Paris skyline. Even awakening Patmosis turns out to be less than helpful when it turns out he is nuclear physicist and not a physician, but a tour of Rameses II’s mummy and his court is at the Louvre, and the power Esperandieu used to revive Patmosis before he died (he was psychically linked to the pterodactyl who suffered a fatal wound from Saint Hubert) may have awakened Rameses and his court including the physician. All she has to do is break into the Louvre with Agathe in a wheelchair and Patmosis re-animated mummy in a bowler hat and suit. This clever and playful film walks a fine line between farce and fantastic adventure , by turns dime novel, silent serial, and gentle satire without ever murdering the delicate mood that calls for with a false move or step. Bourgon, in particular, as our heroine manages a fine balance between outspoken modern woman, brilliant adventuress, and vulnerable sister who only wants to atone for her mistake. This won’t be for everyone, but if you enjoyed The Assassination Bureau, Those Magnificent Men in Their Flying Machines, The Great Race, or Dinner with Adele, you will likely be delighted by this one. And there is one joke, as dry as Adele’s name, that is worth the whole film when the awakened Rameses, admiring the courtyard of the Louvre notes it could use a pyramid. Now why didn’t the French think of that? Granted the CGI is a bit rocky here and there though more realistic would likely have ruined the look and character of the film. The special effects aren’t there to take away from the story anyway, but only to enhance it. Whatever else, this film, dedicated to Tardi, is tribute to his talent as artist and storyteller. I warn you though, I haven’t done it justice, I don’t think any review could. 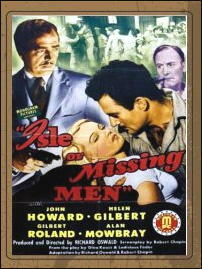 A Movie Review by Dan Stumpf: ISLE OF MISSING MEN (1942). ISLE OF MISSING MEN. Monogram, 1942. John Howard, Helen Gilbert, Gilbert Roland, Alan Mowbray, Bradley Page. Screenplay by Richard Oswald and Robert Chapin from a play by Ladislav Fodor. Directed by Richard Oswald. An unexpectedly classy thing to come from Hollywood’s second-most-beggarly studio of the 1940s, thanks mainly to a literate story from Ladislav Fodor (who gave us Tales of Manhattan and Kiss Before the Mirror), evocative camerawork from Paul Ivano (of Universal’s Sherlock Holmes series), and a surprisingly sumptuous cast for a Monogram film. 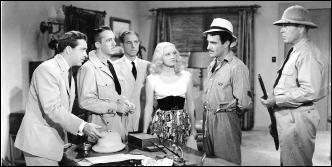 John Howard, from Paramount’s “Bulldog Drummond” series headlines as the governor of a prison island somewhere in the tropics returning to work from vacation who meets a lovely woman (Helen Gilbert) on board the ship taking him back and persuades her to stop over on the island for a few days so they can get to know each other. Turns out the lady in question has an agenda of her own and has deliberately wangled the invitation to the island prison to help her husband (Gilbert Roland, then at the nadir of his career) escape. Dramatic complications ensue when she discovers that he is no longer the gentle, loving man she married, and, later, that he never was, really. Meanwhile, other complications are busy ensuing, including Howard’s officious lieutenant (Bradley Page) who feels duty-bound to check up on Miss Gilbert’s background, and Alan Mowbray’s delightful comic/pathetic drunken doctor, compelled by his love of beauty to help her in what he knows is an ill-advised scheme. All this spins out in a little over an hour, and if the ending seems to lack punch, the surprising depth of characterization makes the trip worthwhile. Director Oswald (father of Gerd Oswald, of the old Outer Limits show) did some interesting work back in pre-Hitler Germany, then fled to the U.S. where his career never got out of the “B” picture rut. His work here shows genuine sensitivity. Similarly, Bradley Page was a perennial second-string movie bad-guy who deserved better; in fact his easy-going outlaw in The Outcasts of Poker Flat (RKO, 1937) deserves a place in Western Movie lore that somehow slipped between the hoofprints. John Howard was forever stuck in place as the low-budget Ronald Colman, and Gilbert Roland ended up a respected character actor, but the real treasure here is Helen Gilbert. Miss Gilbert (whose many husbands included composer Mischa Bakaleinikoff and gangster Johnny Stompanato) simply radiates a sensuality that even a low-wattage movie like this cannot dim, the sort of thing one sees in actresses like Dietrich and Moreau, who had big studio resources to back them up. Her luminous presence here is just the foremost pleasure of a film that deserves seeing. A TV Series Review by Michael Shonk: CAIN’S HUNDRED (1961-1962). CAIN’S HUNDRED. NBC, 1961-1962. Vanadas Production Inc in association with Metro-Goldwyn-Mayer Television. Cast: Mark Richman as Nicholas “Nick” Cain. Theme by Jerrald Goldsmith (aka Jerry Goldsmith). Creator and executive producer: Paul Monash. Produced by Charles Russell. 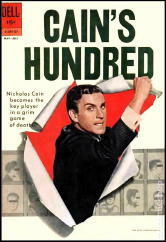 CAIN’S HUNDRED was a weekly hour-long series on NBC. Mark Richman (later to become known as Peter Mark Richman) played Nick Cain, a former criminal lawyer who had represented the mob until he retired and decided to get married. When “The Organization” hit man missed Nick and killed his fiancee, Nick decided to join the law and go after one hundred of the top mobsters, one bad guy an episode. It is enlightening to see how different this premise was handled in the 1960s compared to today’s THE BLACKLIST. It was a simpler black and white world then. The series aired during a time when how television was made was changing. TV continued to settle in Hollywood leaving New York (except for the networks and advertising agencies) behind. The time when advertisers produced the shows was nearly gone and more series were supported by the system we still use, what “Broadcasting” called the “magazine” system, where advertisers buy some time on various series instead of all the time on just one. As the networks and studios took over the producing of more programs such as CAIN’S HUNDRED, they and not the advertisers were making the decisions over content and personnel. CAIN’S HUNDRED was also among the growing number of dramas to replace the half-hour format with the longer hour format. 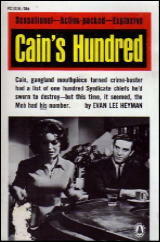 The April 17, 1961 issue of “Broadcasting” had an article that went into great detail about the pre-production history of CAIN’S HUNDRED. According to Robert Weitman, vice president in charge of programming for MGM, CAIN’S HUNDRED was in pre-production (before filming began) for nearly a year. A director for the pilot was hired, stages were built and casting began. January 19, 1961 the filming of the pilot began. It took eight days to film the pilot. A rough cut was ready for viewing on February 15th. On February 28, MGM executive Weitman left Los Angeles and headed to NBC in New York. NBC liked the pilot and scheduled the crime drama series to air in the fall on Tuesday at 10pm. Producer Charles Russell was hired and with Paul Monash began to hire the staff of writers and directors. At this point filming was to begin May 7th. However, production did not begin until June 5th (according to “Broadcasting” June 12, 1961 issue). The series usually aired opposite ABC’s ALCOA PRESENTS and CBS’s hit GARRY MOORE SHOW. Ratings were not good, and CAIN’S HUNDRED was rumored to be facing early cancellation but surprised many by surviving through the entire season. According to “Broadcasting” (December 18, 1961), thirteen episodes of CAIN’S HUNDRED was the original order, than an additional seven episode were added, and finally another ten, making a total of thirty episodes. 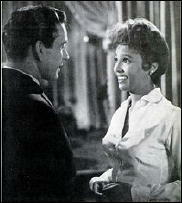 Beyond being opposite of the hit series THE GARRY MOORE SHOW, the series faced an additional ratings challenge with clearances. According to “Broadcasting” (February 5, 1962) CAIN’S HUNDRED aired in its NBC time slot (Tuesday, 10pm) on 126 stations while 25 stations delayed it and aired it in another time period. “Blues For A Junkman – Arthur Troy” (February 20.1962). Written by Mel Goldberg. Directed by Robert Gist. GUEST CAST: Dorothy Dandridge, James Coburn, and Ivan Dixon. *** Nick tries to help old friend jazz singer Norma Sherman who is just out of prison for drug use. Norma finds her husband had left her for another woman. Nick and nightclub owner Arthur Troy try to help get her a license to perform in nightclubs, but problems arise. “The Organization” forces drug-hating Arthur to handle a drug shipment gone wrong. Nick is working this week with a Lieutenant in narcotics who wants Nick to use Norma to find the drug shipment. This was a quality production for the era. The music numbers by Dandridge highlight the episode but never got in the way of the story. The characters were as complex as their problems and no easy answers were offered except for the flawed predictable ending. The other episode I have seen, “The Plush Jungle” is available at the moment on YouTube. “The Plush Jungle – Benjamin Riker” (January 2, 1962). Written by Franklin Barton. Directed by Alvin Ganzer. GUEST CAST: Robert Culp, Larry Gates, and John Larch. *** One of the top men in “The Organization,” Benjamin Riker decides to take over a major corporation traded on the stock exchange. First, Riker uses usual organized crime strong-arm methods to intimate the company’s suppliers to drop the targeted company then he took advantage of the stock market and dropping stock prices and finally the growing conflict between the company’s President and his ambitious young son. Production values behind and in front of the camera were better than the average TV series of the time, but the series was faced with impossible challenges to overcome. CAIN’S HUNDRED, as all television dramas at the time, was dealing with the outcry over TV violence and THE UNTOUCHABLES. While “Blues For A Junkman” had a brief shoot-out, “The Plush Jungle” avoided showing any action or violence, instead using dialogue to imply the threat of violence. This left only the emotional conflict between father and son to supply the story’s drama and tension. Despite the handicaps, writer Franklin Barton’s script developed the conflict well and used the hour-long format to the drama’s advantage. Director Alvin Ganzer did a fine job capturing the emotional tension without letting the all dialogue story get too dull. But I have never seen any TV series treat its lead with such lack of respect as Cain was in “The Plush Jungle.” Unlike the episode “Blues For a Junkman,” Cain is pointless to this story. He can’t understand why everyone refuses to accept just his word that Riker is a bad guy. In one odd scene, one of the characters demands Cain show him proof that Riker was as dangerous as Cain claims, but Cain is unable to do so. After the series hero is told off, Cain exits in defeat, forcing the story to find its hero and protagonist in the guest cast. While during the era of the anthology series, it was not uncommon for a strong guest cast to be featured over the weaker regular lead, but Culp understood the dramatic and long-term needs for any series hero to be the primary star, for him to be in most scenes and be the reason the problem is solved. 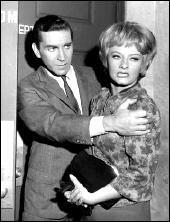 CAIN’S HUNDRED ended with thirty episodes completed and was offered in syndication for the fall of 1962. The series featured some interesting tie-ins such as the soundtrack album, a paperback, and a comic book series. The soundtrack by Jerry Goldsmith (with some music by Morton Stevens) was released and reviewed here. The comic book series lasted two issues, was released by Dell Comics and reviewed here. Popular Library released a mass-market paperback tie-in in 1961, written by Evan Lee Heyman. From the cover blurb it appears the book was based on the origin story. Peter Mark Richman has continue to have a successful acting career that has lasted over fifty years including supporting roles in LONGSTREET and DYNASTY, numerous guest starring roles in TV, roles in films such as NAKED GUN 2 ½, and voice over work. Award winning writer-producer Paul Monash would create JUDD FOR THE DEFENSE, develop PEYTON PLACE, and produce the original film version of CARRIE. The Writers Guild of America gave him its Life Achievement award in 2000. The guest cast featured such talent as David Janssen, Leonard Nimoy, Beverly Garland, Jack Klugman, Robert Duvall, Jack Lord, Robert Vaughan, and Charles Bronson. Behind the line talent featured writers Daniel Mainwaring, Jim Thompson, David Karp and E. Jack Neuman. Directors included Robert Altman, Sydney Pollack, Irvin Kershner, Buzz Kulik and Boris Segal. The series was a respectable attempt at doing a quality crime drama such as THE UNTOUCHABLES, but failed due to too many challenges to overcome, from the anti-violence groups to THE GARRY MOORE SHOW to the relationship between star and showrunner. Reviewed by William F. Deeck: J. J. CONNINGTON – Death at Swaythling Court. 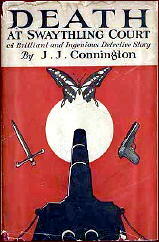 J. J. CONNINGTON – Death at Swaythling Court. Little Brown, US, hardcover, 1926. First published in the UK by Ernest Benn, hardcover, 1926. Penguin, UK, paperback in jacket, 1938. In the usually quiet village of Femhurst Parva, one Hubbard, butterfly collector and blackmailer, has, according to a coroner’s jury, committed suicide. Outside the jury his death creates many questions. Who stabbed him after he poisoned himself, if he did indeed poison himself? Who used a candle and for what in a well-lighted room? Who stole a butterfly? There are too many clues, all of which seem to point in different directions. And don’t forget the local inventor’s Death Ray, the village legend of the “Green Devil,” who apparently is keeping up with the times by using the telephone, and the Invisible Man. This is a splendid example of the English-village novel. The characterization doesn’t go deep, particularly with Colonel Sanderstead, who investigates, but then he isn’t deep. The fair play promised by the author is here, and I’ll brag and say I got about two-thirds of it right. Fine stuff from the Golden Age. Editorial Note: On the occasion of three of J. J. Connington’s mysteries having recently been reprinted by Coachwhip Publications, Curt Evans wrote a long article about the author and the three books and posted it on his blog. Check it out here. A Movie Review by Jonathan Lewis: STORM WARNING (1951). STORM WARNING. Warner Brothers, 1951. Ginger Rogers, Ronald Reagan, Doris Day, Steve Cochran, Hugh Sanders. Screenplay: Daniel Fuchs & Richard Brooks. Director: Stuart Heisler. 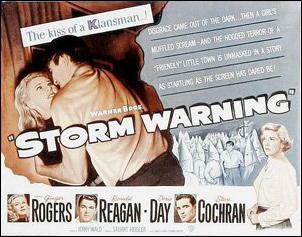 As much a cultural artifact as it is a film, Storm Warning (1951) is about a big city woman who witnesses a murder in a small town, the KKK’s stranglehold on otherwise decent people, and a county prosecutor’s determination to both solve a murder and to bring down the local Klan. Directed by Stuart Heisler (The Hurricane) and starring Ginger Rogers, Ronald Reagan, Doris Day, and Steve Cochran, the film is both a captivating tale of suspense and a cinematic jeremiad against the Klan’s role in the post-war South. With a screenplay written by Richard Brooks (Elmer Gantry) and Daniel Fuchs (Criss Cross), Storm Warning is notable for its strong anti-Klan message, its bleak depiction of the mores of a particular slice of small town America, and its tragic, downbeat ending. 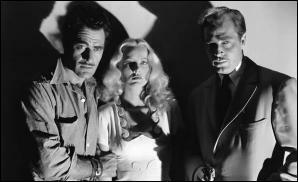 Indeed, shadowy black and white cinematography, a setting with dark streets, a neon-lit diner, and an abandoned bus terminal, and a brutal on screen murder, signal Storm Warning’s arrival as a film noir. After about forty minutes or so, however, the film morphs into a middling courtroom melodrama more suited for television than for the big screen. 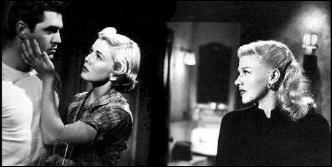 It then reverts to noir, albeit of an even darker shade, for film’s shockingly violent and tragic conclusion. The plot’s basics are as follows. A bus is passing through the small southern town of Rockpoint. One of the passengers, a dress model named Marsha Mitchell (Ginger Rogers), has a sister in town. Since she hasn’t seen her sister in person for two years, she decides to get off the bus in hopes of catching up with her sibling, promising her traveling companion that she’ll catch up with him soon. Something seems eerily wrong with the town. The guy who checks luggage at the bus terminal is in a hurry to close up, the local cab driver has no interest in driving his cab, and a diner is closing unusually early. Without a cab to take her to the recreation center where her sister works, Mitchell has to walk alone through the town’s dark, abandoned streets. Soon Mitchell witnesses a scuffle outside the local jail. Klansmen are beating a print journalist, Walter Adams, who had been imprisoned on possibly trumped up charges after investigating the Klan. Mitchell witnesses the violence and tries to hide. Things go from bad to worse when one of the Klansman, his hood removed, shoots and kills the reporter. Mitchell finally makes her way to her sister’s house. While catching up, she learns that her sister, Lucy Rice (Doris Day in an early non-singing role), is not only happily married, but also pregnant. Soon, her sister’s loser husband, Hank (Steve Cochran), comes home. Not only do we learn that he has an alcohol problem; he’s also the same guy who shot and killed the reporter. Marsha Mitchell has an ethical dilemma. Does she admit that she knows what the husband did? Does she tell the authorities? What responsibility does she have to ensuring her sister’s happiness? What responsibility does she have to tell the truth? What would the consequences be of each possible choice? The movie deals with these very questions. 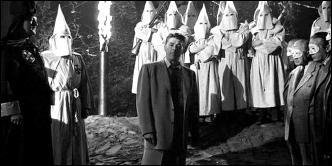 Tasked with solving the murder is the local district attorney, Burt Rainey (Ronald Reagan), who is well aware that many of his former high school classmates and neighbors are either in the Klan or are afraid to say anything negative about them. Rainey is determined, however, to seek justice for Walter Adams. He doesn’t think much of the Klan, essentially viewing it as a corrupt racket. Eventually, Rainey learns that Marsha Mitchell had witnessed the crime and orders her to a coroner’s inquest. From there, the film takes several twists and turns, only to culminate in an especially noir ending that takes place at a chillingly realistic looking Klan rally out in the woods. As I viewed Storm Warning, several things struck me. First, despite its clear anti-Klan message, there are no explicit references to the Klan’s racism. The viewer is supposed to understand what the Klan is and what it does. This is no Mississippi Burning. More notable is the fact that the Klan is presented as a corrupt, fraudulent organization rather than as a vehicle for hate. There are also very few non-white faces in the film. Likewise, not a single character has a Southern accent. Finally, the film is notable for its almost complete lack of levity. Except for a moment in which Rainey’s mother notes that she didn’t vote for her son in his election for district attorney, but would do in the future, the film has almost no memorable humorous or happy moments. Reagan succeeds in portraying Rainey as a lonesome warrior for good. Steve Cochran portrays Hank Rice as almost too stupid to be truly evil. 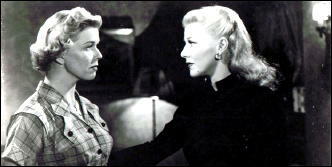 The two female leads, Ginger Rogers and Doris Day, portray sisters who have completely different personalities. While Mitchell (Rogers) is guarded and cynical, Rice (Day) is ebullient and distressingly naïve. Storm Warning is very dark, unhappy, and claustrophobic film. But it’s not one a viewer will soon forget. If you choose to watch it, the violence of last ten minutes or so will probably stay in your mind for some time to come. I’m pretty sure that’s what the screenwriters wanted. YOUNG DETECTIVE DEE: RISE OF THE SEA DRAGON. China Film Co-production / Huayi Brothers Media, 2013. Original title: Di renjie: Shen du long wang. Mark Chao, Feng Shaofeng, Angelbaby, Lin Gengxin, Carina Lsu, Kim Bum. 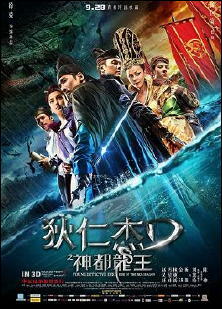 Screenplay: Kuo-fu Chen, loosely based on the historical Judge Dee. Director: Tsui Hark. Judge Dee, the historical 7th century Chinese magistrate brought to the western world by Robert Van Gulik, was a figure of myth and folklore in Chinese literature, though nothing quite like the Detective Dee we see here and in Detective Dee and the Mystery of the Phantom Flame, the 2010 film this is a prequel to. Here Dee Renjie (Mark Chao replacing Andy Lau in the first film) has been dispatched from the province of Bing to join the Dai Lisi, the imperial investigative service in Luoyang, the holy city of the Tang Dynasty in 665 AD, and it’s an inopportune time to arrive with Empress Wu Zeitian (Carina Lau returning from Phantom Flame) wrapping the Emperor around her little finger, a war with a far off province, trouble being stirred by the Dondo islanders, and the Imperial Fleet at the bottom of the Pacific thanks to a sea dragon. Then there is Yin Ruiji (Angelbaby, and well named), the beautiful courtesan wanted by every nobleman in China, hated by the jealous empress, chosen by the people to fast and pray for deliverance from the sea dragon, and incidentally the target of two different kidnap plots and a mysterious sea creature that appears to be half man, half fish. She is also in love with a commoner Mr. Khen (Kim Bum) who owns an exclusive tea shop that caters to the imperial court with a tea blend made only for the nobility, and who disappeared six months earlier. Just a typical day in a great detective’s life. If you know the films of Tsui Hark (A Better Tomorrow, A Chinese Ghost Story, Once Upon A Time in China) you know they well be hauntingly beautiful to watch, the action will be relentless, the camera work and photographic effects spectacular, the wire work exceptional. Tsui Hark’s films are extraordinary visions, thought the plots are sometimes as complex as a Chinese puzzle box. Young Dee has no learning curve, he is introduced fully blown watching a procession by the locals to enthrone Yin Ruiji to drive away the sea dragon. It is also the first time he spots the Chief Minster of the Dai Lisi, Yuichi Zhenjin (Feng Shaofeng) whose life and career are on line with the Empress if he does not solve the mystery of the sea dragon. The friendship/rivalry between Dee and Yuichi is the basis for much of the films inner tension as Yuichi’s skill, rank, and experience are more than matched by Dee’s brilliance and audacity. When Dee uncovers an attempt to kidnap Yin and foils it he finds himself fighting two sets of kidnapers, ordinary criminals, and a water creature of incredible power. Joined by Yuichi Dee ends up imprisoned where he meets Shatuo Zhong (Lin Gengxin) a young surgeon apprenticed to the Imperial Dr. and soon to be Watson to Dee’s Holmes. Dee’s escape to prevent a second attempt on Yin will team him with a reluctant Yuichi as they fend off Dondo islanders behind the attempt, and Dee recognizes that it is not Yin, but the creature they are after. When Yin reveals the the monster is really her lover, Yuan Dee must capture him and try to cure him to solve the mystery. Yuan was poisoned by a parasite that made him into a monster, and the parasite has been placed by the Prince of the Dondo into the special tea made by the tea master. All of the court including the Emperor have been poisoned. The plot grows more complex as the empress dislike of Yin, who comes from a warring province, leads to her life being endangered, and it becomes clear the Dondo prince has created and trained a mighty sea dragon and plans to invade and crush the Tang Dynasty. Dee and Yuichi must race to find the island fortress of the Dondo and destroy them or the empress will execute Yin. This leads to a terrific vertiginous four-way fight between Dee, Yuichi, and Shatuo against the armored Prince hanging from cliffs far above the hideout where the sea dragon is hidden. The death of the prince isn’t the end though, as they have to survive the voyage home and an attack by the giant beast, a sort of giant flying manta that previously sank the entire Chinese fleet. This epic is entertaining, and mystery fans will enjoy Dee’s Holmesian moments when he gets to display his talents as sleuth with brilliant deductions. There are some nice photographic effects illustrating how Dee’s mind works in observing and deducting. Other than the name, this has little to do with the historical Dee or Van Gulik’s version of the tales, but is an entertaining, full color, and apparently 3-D epic in and of itself. Some of the CGI isn’t all that good, but it is made up for by the imaginative camera effects and director Tsui Hark’s skilled hand at this sort of thing. The wire work is well choreographed, and the actors easily recognizable. The film ends with the Emperor presenting Dee with the mace of justice, the symbol that he is the the sword of justice for the kingdom, even to the misbehavior of the imperial family (a fact not appreciated by the ambitious Empress Wu). The film is fast-paced, action-filled, intriguing, and an interesting blend of summer blockbuster and detective story — replete with dragons, monsters, a tender beauty and the beast story, and two mad scientists. Both this and the first film are worth seeing for the spectacle and the sheer fun. Depending on how you feel about Hark’s better known work you will almost certainly enjoy this one. (*) If anything, this reminded me a little of Boris Akunin’s Erast Fandor novels, though more fantastical.